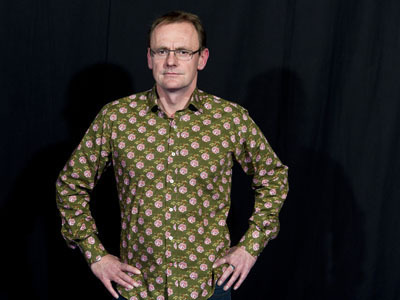 Sean Lock performed at the HAC for a comedy fundraising Christmas lunch organised by Inconnection. His adaptation of his own material for a rowdy pre-christmas crowd was really entertaining. It’s great to watch a performer in complete control. He’s is very much like his dry on screen persona in real life too. I photographed him as soon as he was off stage at the back of the pavilion. The HAC pavilion is a temporary seasonal structure (on top of the cricket pitch!) with black curtain walls, a black ceiling and black floors which absorbs all the light. I decided to point two lights straight at him and expose for the face and leave everything to fall away into the black to give an on-stage performance look but still keeping his gaze straight to camera.